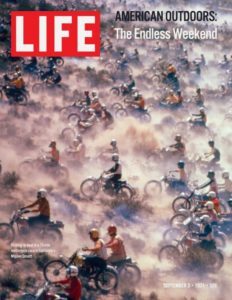 In 1971 a picture was published on the cover of Life Magazine, for the American public to see. In a two-page presentation, it raised a question. 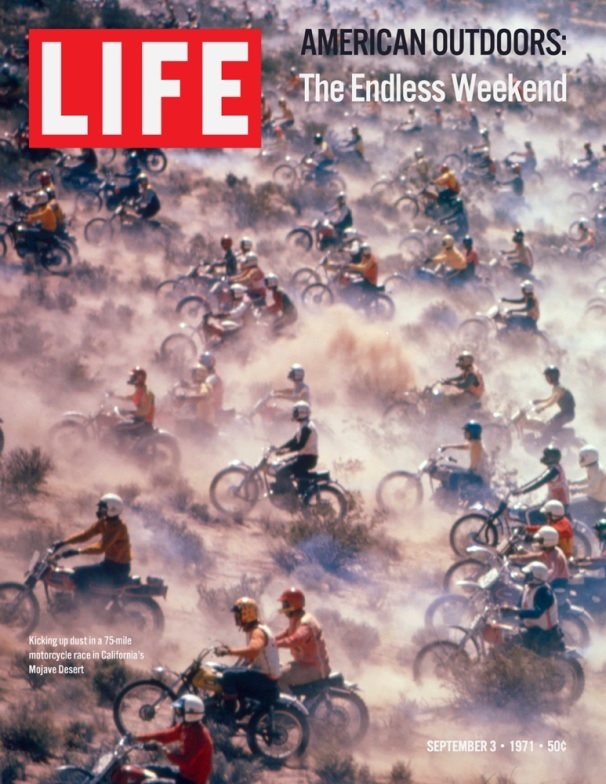 The picture was of hundreds of off road motorcyclists entered in the annual Barstow to Las Vegas Race. It begged the question, have we gone too far in allowing the destruction of our Mojave Desert? The event had grown in popularity over the years and had apparently reached critical mass. The environmentalists, always looking for visual science to support their cause, jumped on a bandwagon led by the Sierra Club to lock up the desert. In all honesty when I saw the magazine in 71 I agreed they had gone too far with so many motorcycles in the race. My goodness, they were destroying the desert. That’s how stupid I was in those days. What can you expect? I was a Democrat. In February of 1993 the newly elected Senator Feinstein declared her Senate Bill S-21, the Desert Protection Act would be passed, “within 90 days.” It finally did pass the Senate and in July of 1994 it passed the House as HR 518, a year and a half after her brave statement. While the House Bill has been changed in favor of property owners and property rights it still allows locking up millions of acres of desert. The interesting side of the story is reviewing why Senator Feinstein was so adamant about sand and desert tortoises. Enters The Catellus Development Corporation, a huge company that was formerly part of the Santa Fe Railroad. The Santa Fe Railroad was given millions of acres of land by the federal government at the turn of the century. That land has ended up with Catellus, a long time supporter of Dianne Feinstein. They supported her when she was Mayor of San Francisco and she returned the favor by giving them a multi BILLION dollar development contract of the Mission Bay Project in San Francisco. When Lady Di ran for the Senate, Catellus is said to have kicked in about $100,000. Catellus has not finished the project in San Francisco and their stock has dropped from a high of $38 a share to $8 today. In Feinstein’s S-21 she authored a deal for Catellus that would give the corporation the ability to trade their desert sand acre for acre with any land owned by the federal government the government might want to sell. Imagine that she wanted for the taxpayer to trade an acre of San Francisco or Dallas for an acre of sand in the Mojave. Sounds like a deal to me. That is if you are Lady Di’s husband. This is land that, if Ms. Feinstein had gotten her way, Catellus could have swapped acre for acre, and Catellus owns a reported 800,000 acres of sand. Ironically two other backers of cutting some kind of deal for Catellus are Representatives Miller, 7th District CA, and Representative Stark, 13th District CA. Catellus also owns property in their districts. Feinstein did not get her way and the deal for Catellus has been extended to all property owners in the area targeted for the land grab. The latest being a dollar for dollar swap with an immediate credit account to be opened in Catellus’ name. This, could according to the San Francisco Chronicle, give Catellus instant credit in the amount of as much as $500,000,000.00. Feinstein said, “There is no effort, intent, desire- nor will there be to give Catellus any kind of special benefits „, What we are trying to do is minimize up front dollar costs (of buying desert land).” (BUYING DESERT LAND?) Isn’t Lady Di’s husband in Real Estate? As a side note, around 1993 I was invited to speak at a Blue Ribbon Coalition event in the Mojave. 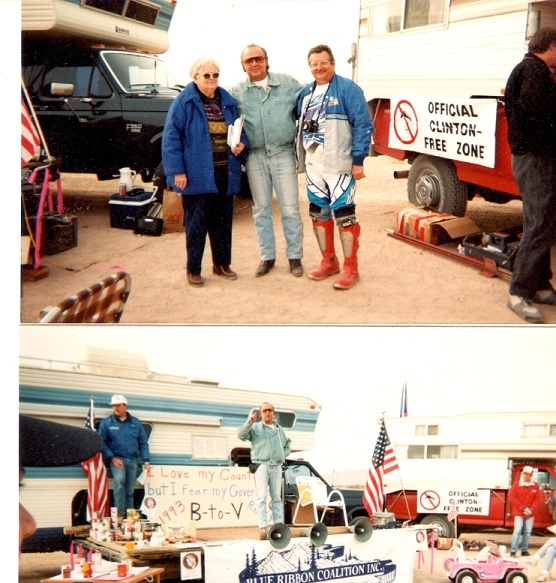 It was an event opposing S21 and in support of the Barstow – Las Vegas motorcycle race. I can’t remember if there was actually a race or not. The BRC is still in operation as a defender of off road activities. About a hundred people showed up and we had a BBQ and a lot of fun making fun of Bill Clinton. I met Hildamae Vought, (upper left photo), a long time local resident. She was there in 1971 when the famous picture was taken. What had happened was the motorcycle’s wheels had tilled the soil and the flowers grew. All along the path from Barstow to Las Vegas a massive bed of flowers about a half mile wide. On each side of the flowers where the motorcycles had not been, the desert was barren with hard packed dirt, sand and brush. No wildflowers. The day of the event looked bad, but look below at what it must have looked like six months later. So the answer to the question, have we gone too far in allowing the destruction of our Mojave Desert? The answer is no, we can’t really harm the desert. Even when it looks like what we’ve done is bad, it turns out to be a God send. In the words of Bruce Vincent, a logger. “We’ve become a society of visual scientists that believe if it looks bad it must be bad,” and that’s not necessarily true. Not the actual photo of the time, but how it must have looked after the race.